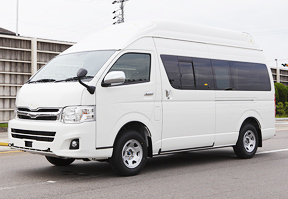 Manufacturing in Gifu Auto Body | Gifu Auto Body Co.,Ltd. 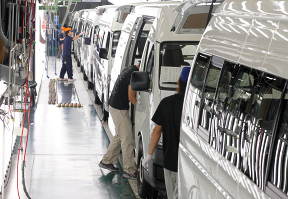 As a complete vehicle manufacturer of Hiace, we have great pride in the quality of each vehicle. 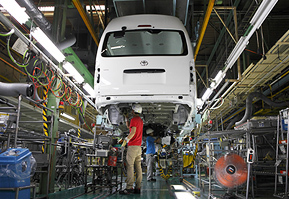 Gifu Auto Body has been awarded the Total Quality Management Award for eighth consecutive years in quality improvement activities from among Toyota’s 16 complete vehicle manufacturing plants in Japan. This is the proof of "Top in Quality" of all domestic factories of Toyota’s car manufactures. However, there is no end to our commitment to quality improvement. We always set higher targets to challenge ourselves to improve. Our philosophies are to eliminate waste thoroughly and "No defective products to the market". 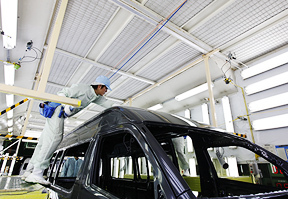 It is the origin of Gifu Auto Body manufacturing to make positively improve. 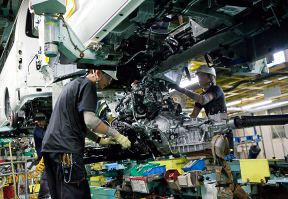 Just In Time is a typical element of the Toyota Production System, which is the process management of "Supply the right material, at the right time and in the exact amount". We use in-house manufactured automated guided vehicles (carts), which carry parts in one or two units to predetermined locations in the plant. For this system, not only the lead time of production can be reduced and efficiency can be increased, but also the waste of excess inventory in the production line and overproduction can be eliminated. 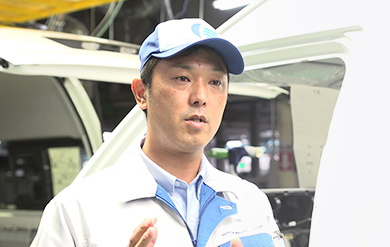 In Gifu Auto Body, under the concept of guaranteeing the quality yourself in your own work range "Self Process Completion", perform a strict quality check on all of the process steps and pass only quality products to a latter process. In case of defectives or abnormalities found, the worker turns on the lamp called "Andon", then calls the relief personnel and they examine countermeasures. If the problem is not solved in that work area, production is stopped to remove the cause and fix the problem. It is well-known that 5S (Seiri: Sort, Seiton: Systematic arrangement, Seiso: Shine, Seiketsu: Sanity (clean), Shitsuke: Sustain) influences quality of the manufacturing process, we are working on our own 5S called "The best 5S" which aims 5S at a higher level. Efficient and easy-to-manage equipment, level up of receiving management, education and training, standardized work with no waste. To pursue them constantly, to improve all information and problems regularly with "visualization", this, as a result, contributes development of the company and improvement of each employee’s life. Overburden, waste and irregularities. 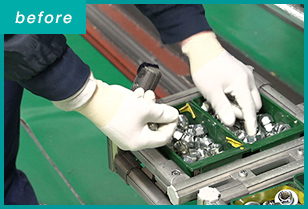 In order to solve the various problems that occur in the production site, work improvement called "Karakuri (Mechanical) improvement" which develops with devises at a manufacturing site proactively helping to each other, is part of our initiatives to support manufacturing. The key point is that it should be implemented at a low cost, it should not use new power such as electricity and be operated by utilizing its own weight. The person whose "Karakuri improvement" which contributes to improvement such as safety, quality and productivity, will be paid a reward according to its content. Wheel mounting process was set manually by temporarily screwing six nuts which were individually counted. 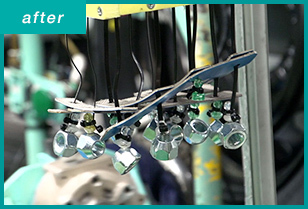 A simple contraption mechanism using the power of the conveyor, automated setting the nuts rather than manual work. "Never supply the defective products to the market" We attain the determination in thorough management. We believe that the quality of the production process is determined by four Ms, "people = Men," "equipment = Machine," "material = Material" and "How = Method". By building incessantly all these 4M improvements, we have made a strong production site to meet a short delivery time of high-mix low-volume production. Listed as specific initiatives for improvement is "The best 5S". This is "Seiri (Sort), Seiton (Systematic arrangement), Seiso (Shine), Seiketsu(Sanity(clean)) and Shitsuke (Sustain)”, initiatives to achieve an impressive accuracy. For example, one tool, determine the place and placement to be able to take it out immediately, with a written display. Fundamental to this is the determination of "Never supply defective products to the market", and it is aimed to achieve that only quality products are produced from the beginning of the manufacturing process. However, no matter how much better equipment and materials are, they are used by people. From the perspective of "Manufacturing leads to human resource development", cherish the corporate culture of teamwork emphasis which has been handed down since the company was founded, and I want to focus on strengthening human resource development.